If you love crisy, fried taquitos or flautas, then you are going to LOVE today’s recipe. Recently, I came across this Baked Chicken and Spinach Flautas Recipe and thought this was amazing idea. Why have I not thought of this myself!? Living in Southern California, I have access to some of the most delicious Mexican food around. That’s both a blessing and a curse. But I adore Mexican cuisine, and love experimenting with healthier, low calorie Mexican food recipes like these Baked Flautas. Let me just tell you, they were incredible. My rolling was a little sloppy, but I’ll work on perfecting that the next 300 times I make them :). My entire family loved them, and even my 4 year old couldn’t get enough. I barely managed to grab a few to take a picture! Seriously, they were delicious. 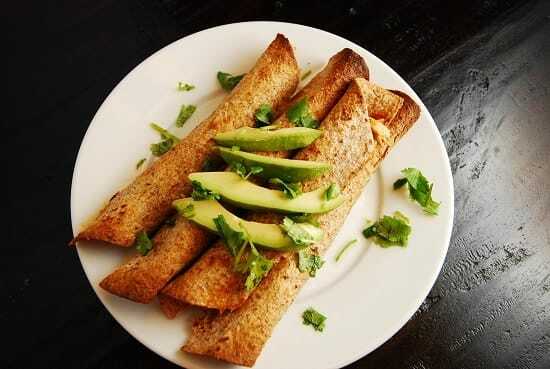 If you love Mexican food, these Weight Watchers Baked Taquitos are an absolute must try. Enjoy! You’ll feel like you’ve hit the low calorie Mexican food jackpot with these baked taquitos! Flavorful, crunchy and deliciously fresh tasting, they are the perfect way to eat a healthier version of a popular Mexican comfort food. Preheat oven to 450. Spray a large baking sheet with non-fat cooking spray. In a medium sized pot, place chicken breasts and garlic, then cover with beer and broth. Bring to a boil, then reduce heat to medium. Cover and simmer for about 20 minutes. Remove chicken prom pot and place in large bowl. Using two forks, shred chicken well. Add in jalapenos, salsa, shredded cheese, chili powder, garlic powder, cumin, paprika, and salt and pepper. Cut all tortillas in half, and spoon 1/12 of the chicken mixture onto the tortilla. Roll the tortilla up, starting with the straight edge. Place seam-side down onto baking sheet. Repeat with remaining tortillas. Lightly mist all the taquitos with an olive oil mister. Place in oven and bake for about 5 minutes, then flip them over and bake for another 5 minutes, or until the tortillas are crispy. Serve with extra salsa and/or sour cream for dipping. Your recipe is vague, in reference to the torillas….6 whole wheat tortilla’s is a very vague description. what size tortilla was use in this recipe? the size you use, will change the point value of this recipe…. Is the beer interchangeable? Or does the Corona offer something significant to this dish? You can use any kind of light beer you want. I chose Corona because I like the light, slightly lime taste that it brings to the chicken. could you use corn tortillas if you want to go gluten free? You can try it! I haven’t tried it yet myself, but I think it would work.